If you’re a returning visitors to this blog, you’ll probably have noticed that I often work with a CMS called concrete5. It’s a neat CMS to work with for end users but also very powerful to extend for developers. No surprise, I wanted to see if I could get concrete5 running on GAE for PHP. The documentation has clear instructions that help you to get a test environment ready on your local computer. You’ll need to install Python, PHP as well as the Google App Engine SDK for PHP, more about that here: https://developers.google.com/appengine/docs/php/gettingstarted/installing. When working on your local computer, you can easily use your existing MySQL installation but if you want to deploy your application to the cloud, things work a bit different. Unfortunately I wasn’t aware of that, I thought that if I only use very little resources, App Engine would be free. From what I can tell, you can run a PHP application for free but as soon as you want to store something in a database, you have to pay. There are two different options, first Google Cloud Storage which is a simple database without a lot of functionality, if you want to port an existing SQL based application, you might want to look at Google Cloud SQL which is a MySQL database running in the cloud. More about that here https://cloud.google.com/products/cloud-sql. Here are a few technical things that you might want to check out https://developers.google.com/appengine/docs/php/cloud-sql/developers-guide. Since I wanted to move my concrete5 site concrete5.ch to Google App Engine, the fact that storage isn’t free, is a killer argument at the moment. I’d very much like to finish the experiment but I’ll wait till I have a project where I actually make some money before I spend money. However, I’m pretty confident that I could get concrete5 running on App Engine. This article might be very specific for one issue and also a bit hacky, but something when you care about your search engine ranking a lot, it might be good idea to look at it. If you move an existing site to concrete5 which was in the internet for a while, you’ll have a number of websites that point to your site. Depending on the old CMS, if there was one, the URLs might look different than common concrete5 URLs. What choices do you have in such a situation? Do nothing and wait till Google updates its index, but keep in mind that other websites might never update their links unless someone tells them to do so. We’re going to make a few minor changes to make it possible to use this addresses without having to add a redirect. Google nor any visitor will see a change unless they look at the source code of the website. To achieve this, we need to modify the .htaccess file. If you aren’t familiar with it, in short: It’s an Apache specific file that lets you add certain configurations without having to touch the central configuration file. Before you continue, make sure you’ve got pretty URLs activated, to do this, type “pretty urls” in the intelligent search box in concrete5 and tick the checkbox. If everything works, this change should work as well. The interesting part is the first RewriteRule. It tries to match every request where there’s a “.html” at the end. If it found one, it will extract everything before the “.html”. The “. *” is the rule that matches everything and the brackets around it, make sure it gets saved as a variable, $1 in our case. The E=HTML_URL creates a new variable called REDIRECT_HTML_URL with the value of our path. The first part REDIRECT_ is always added by Apache. That’s all it takes, after you’ve made these changes, you can go on an use .html at the end of your URLs. There’s a check which looks for SERVER_PATH_VARIABLE which is exactly what we’re using. Since concrete5 checks a few more things, we can still use the original page paths like /about. Now that we can process requests ending with .html you might wonder what we can do to create such addresses. This requires a bit more hacking but it’s also possible. In most cases where you have a link, concrete5 uses a helper called “Navigation”, here’s the official documentation about it: http://www.concrete5.org/documentation/developers/helpers/navigation/. We can override this helper and add “.html” to the links generated by it. This hacky code will change your URLs and thus make sure you’ll have .html in your internal links. As mentioned at the beginning, this solution is pretty hacky but might work in case you must keep the existing URLs. Let me know if there are things that I’ve missed. I’m happy to announce that the second edition of my concrete5 beginner’s guide is available. You can get your copy from Amazon or Packt Publishing. The book has been updated to match the current version 5.6.1 and thus assures a better experience when following the examples. There was also a lot of valued feedback from new reviewers that has been incorporated in this edition. Thanks a lot to you guys, your feedback was very much appreciated! Please keep in mind that this is a second edition, not a different book. If you read the first edition and managed to update your knowledge to the latest concrete5 version, there’s not much you’ll learn. The book is mostly aimed at people who want to get started with concrete5 and hesitated to buy the book because it’s a bit out-dated by now. If there’s anything you’re missing, let me know about it – I’d be happy to publish articles on this blog to fill the gaps which were missed in the book! There are plenty of jQuery plugins for this job around as well, but this time we’re going to create everything from scratch. Thanks to jQuery, this is going to take neither a lot of time nor lot of lines of code. To keep the example as simple as possible, we’re not using any pictures at all. 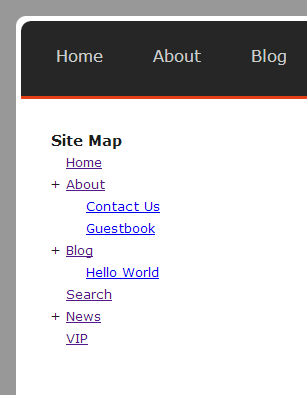 You can surely find a way to improve the layout once you’ve had a closer look at the jQuery code. 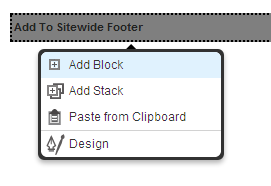 Create another directory structure for our template blocks/autonav/templates/tree. // those span element being part of a parent element get a "+"
Click on the block after you’ve inserted it and select Custom Template and select the Tree template. Confirm the change and reload the page. This is another template which doesn’t use any external jQuery libraries at all. Thanks to jQuery, we only needed a few magic lines of code to add a small “plus” sign in front of all pages with subpages. It uses three lines of code to hide the subpages when the user clicks on the “plus” sign, and a small PHP template which includes the default template but replaces the ID to avoid any complications with other navigation blocks on the same page. If you ever worked with tables in a web application, you’ll probably have had to build some kind of pagination. If you only have very few entries, that’s not necessary but if your database grows, you’ll probably need to display the data in pages of 20 items. In this tutorial, which is aimed at developers knowing concrete5, I’ll show you the use of a helper in concrete5 that does a nice job and helps you a lot in a way you’ll always add a pagination, even if you think you’ll only have 10 entries in the table. It’s been quiet on CodeBlog.ch but I wasn’t taking a break from writing, I just spent my writing time on a new book. You can already order it on amazon http://amzn.to/159G3cG or directly from the publisher: http://www.packtpub.com/creating-concrete5-themes/book. The book focuses on concrete5 themes. It’s assumed that you have some experience with HTML and CSS and also know how to read PHP code. Some programmierung experience is recommended! I hope you’ll find it useful and will build lots of great sites with concrete5! If you worked with concrete5 before you probably know that there’s an in-site editing system where you can place a different kinds of blocks in areas. Usually a page has several areas and your site probably has several pages. This concept might have been a bit uncommon but once you’re used to it, it’s rather powerful and easy to understand as it allows you to edit your site in a layout more or less identical to the layout the site has to visitors. Placing content in a block works fine but if you wanted to have the same content on several pages it’s going to be a bit tricky. Assume you want to put a certain content in the footer of every page. There used to be a feature called “Scrapbook” which has been replaced by “Stacks”. You can find more information about this on the following page: http://www.concrete5.org/documentation/how-tos/developers/concrete5-5.5-stacks-vs.-scrapbooks/. 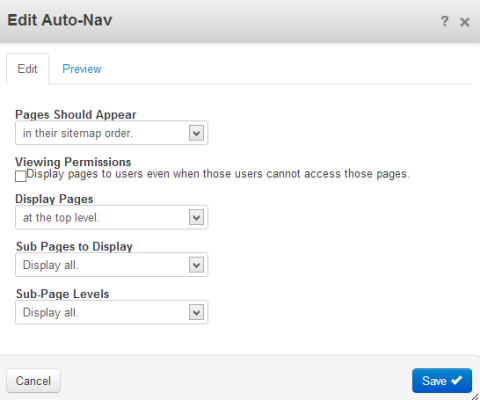 This is one option you can use, but there’s another one where you can stay on the page you’re editing while amending sitewide content (when editing a “Stack” you’re being redirected to a dashboard page). with concrete5 you usually put your add-on code in a package and don’t touch the core. This concept allows you to update the CMS core without overriding anything you’ve built on your own. In order to interact with the CMS you can use several functions helping you to integrate your add-on into the CMS interface. In this short article we’re going to look at a simple example which will place a button next to the edit button and shows a dialog with a quote. Nothing fancy, just an example aimed at developers who want to use this feature in their add-ons. They check if a proper link tag has been set:<link rel="shortcut icon"
www.oraclerecipes.com 88.222.33.111 - - [04/Sep/2011:08:09:23 +0200] "GET /favicon.ico HTTP/1.1" 404 751 "-" "Mozilla/5.0 (Windows NT 6.1; WOW64) AppleWebKit/535.1 (KHTML, like Gecko) Chrome/13.0.782.220 Safari/535.1"
The concrete5 URL rewriting rules check if the requested path is a static file but since it doesn’t exist, the request is forwarded to the dispatcher. This means that concrete5 will search through its database to see if there’s a concrete5 page available at /favicon.ico but obviously won’t return anything else but “Page not found”. This database lookup can easily consume 100ms which isn’t a lot but assuming you’ve got a busy site, this is probably still something you’d like to get rid!